On Sunday, June 11, the public is invited to peruse several captivating exhibits, free of charge, at the grand opening of the Oregon Jewish Museum and Center for Holocaust Education’s permanent location in the Pearl District. The museum’s newly acquired building on the corner of Northwest Davis Street and Eighth Avenue is more than twice the size of its previous home in Northwest Portland. It includes a 100-seat auditorium, a gift shop, a café featuring Jewish deli items, a children’s play area and a dynamic two-story exhibition space for its core and rotating exhibits. The inaugural exhibit features the tapestries and other works of famed Russian Jewish artist Grisha Bruskin. But it’s one of the museum’s new core exhibits that couldn’t come at a better time for Portland. As guests walk through “Discrimination and Resistance, An Oregon Primer,” they may notice that the horrendous Memorial Day weekend attack is not an anomaly, but merely a new chapter in Oregon’s long and sordid history of deep-rooted racism. Guest curator Janice Dilg illuminates this history from Oregon’s days as a territory through the 20th century, leading up to more recent examples from the fight for marriage equality. Dilg is the principle of HistoryBuilt, a Portland-based history consulting company. Photographs and historical documents serve as a glimpse into an Oregon that, in the 1920s, had the highest concentration of Klansmen west of the Mississippi, with more than 60 local chapters of the KKK spread across the state. 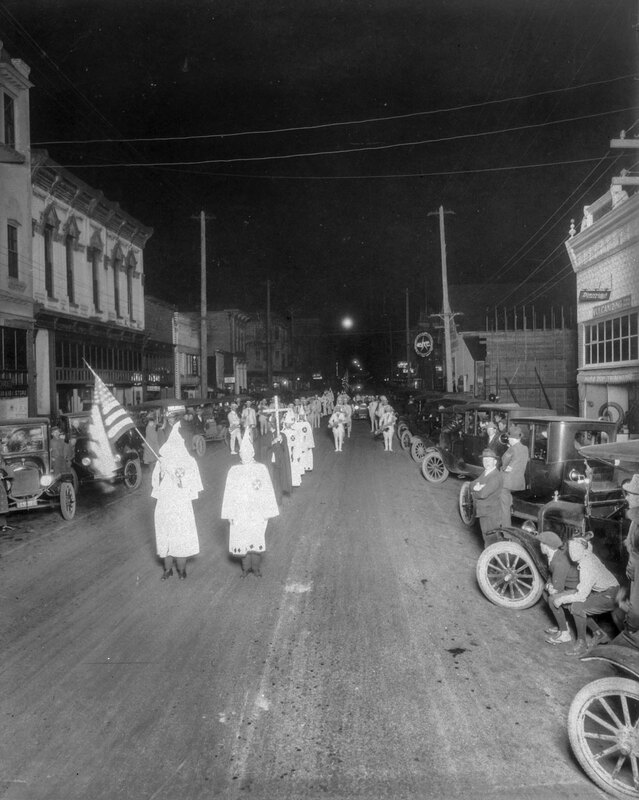 This image from a 1923 Ku Klux Klan parade in Albany is featured in “Discrimination and Resistance, An Oregon Primer.” Oregon claimed the largest KKK membership of any Western state, with branches in every part of the state by 1925. “You can draw the line from white supremacy in the 1920s right to Friday night,” said Dilg, in reference to the MAX-train attack that left two Good Samaritans dead and another seriously wounded for taking a stand against racist abuse inflicted upon two black girls. The three-dimensional exhibit will reveal to visitors that Oregon’s predominantly white demographic is no accident, but rather achieved by design through centuries of exclusionary laws and intentionally oppressive practices. It’s a history that’s entered the national dialogue in recent weeks, with commentaries in The Atlantic, The Washington Post and Huffington Post all quick to point out Oregon’s racist past in connection with the attack. But that’s only one side of Oregon’s story. Dilg’s exhibit gives equal weight to the parallel history of the courageous Oregonians who resisted that discrimination, who refused to leave despite efforts to push them out, and who fought to reform the state in the face of great opposition. As she poured through newspaper archives, Dilg said, she noticed it was difficult to differentiate between time periods based on words alone. FURTHER READING: Should we compare Trump’s America to Hitler’s Germany? Often, it has been Oregon’s victims of discrimination who were also its agents of change. One example Dilg pointed out is the Unthank family. They were a black family forced, through intimidation, from their home in an all- white Portland neighborhood in the 1930s. But DeNorval Unthank and his wife, Thelma, were also civil rights pioneers. He was one of the first medical doctors to serve Portland’s black population when hospitals were segregated. When his son, DeNorval Unthank Jr., fell in love with Doris Burgess, who was white, the couple had to marry in Washington because interracial marriage was illegal in Oregon until 1951. But Unthank Jr. was also the first black graduate from the University of Oregon’s School of Architecture and Allied Arts and was a lifelong advocate for the black community. Recently, there was a black student-initiated effort to rename UO dorm Dunn Hall, which was named for Frederick Dunn, a high-ranking member of the KKK. On June 2, the Board of Trustees unanimously approved the new name: Unthank Hall in honor of Unthank Jr.
Dilg’s exhibit also takes aim at the collective tendency of dismissiveness toward the racist actions of white America’s ancestry. She hopes when visitors learn how the NAACP introduced the first public accommodation law into Oregon Legislature in 1919, it will make it harder to chalk the oppression up to ignorance. Oregon didn’t adopt the Civil Rights Bill until 1953. Dilg designed her exhibit not chronologically, but thematically around the tools used for both resistance and discrimination throughout history. She said she wants people to question how this happens “over and over and over” so they might learn how to recognize discrimination when they see it and how to intervene and break the cycle. Docents and museum staff will be on hand to offer tissues and shoulders to guests, who will also have an opportunity to reflect on how discrimination has played a role in their own lives as an interactive part of the exhibit. “I am anticipating that our visitors are going to have a wide range of emotions, and if tears are part of that emotional outpouring, I think that we want to make sure that our visitors know they are in a safe space,” Margles said. • The Action Lab will offer an interactive social justice experience where visitors will have the opportunity to initiate action to help their community. Every first Sunday of the month from July through October, the OJMCHE will conduct free public tours of the Holocaust memorial in Washington Park from 1 to 2 p.m. The memorial is at the intersection of Southwest Washington Way and Wright Avenue. Museum docents, many of whom are Holocaust survivors and family members who will share their personal stories, will conduct tours.